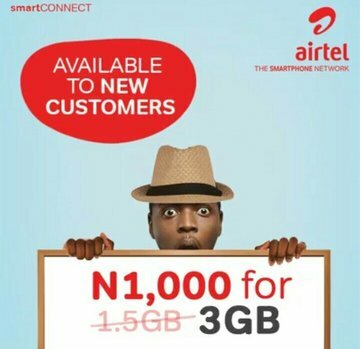 Airtel Nigeria has finally introduced another great offer for their new customers, This new offer is now working flawlessly nowadays on new sim card only. The new offer gives all new subscribers double data and double bonus whenever they purchase any data plan. This offer also works on some lucky old Airtel sim as well, But with truth speaking, I will surely advise you to get a new Airtel sim, So that you will be easier for you to enjoy the free double data bonus on your phone at any time you want to. To get this Double data bonus on your device, you don't have to do a lot of work, All you have to do is, just visit any Airtel Experience center, get a sim, register then recharge the line once the sim is fully activated. Once you Recharge your new registered Airtel sim, Now quickly dial *141# on your phone to purchase any data plan of your choice to enjoy the amazing offer.